Trump’s JCPOA and INF pullouts are the latest examples of why the US under Republicans and undemocratic Dems can never be trusted. Both right wings of the US one-party state want everything their own way in return for empty promises, the disturbing reality of diplomacy with America. Time and again, other nations are betrayed, including Iran, Russia, China, North Korea earlier and likely ahead. Good faith Kim Jong-un mid-June summit talks with Trump risk being undermined by regime hardliners Pompeo and Bolton. “discussions with North Korea…a waste of time…The way to end the North’s nuclear program is to end the North,” he roared. After earlier talks with DPRK officials in Pyongyang, its Foreign Ministry accused Pompeo of unacceptably pushing a “unilateral and gangster-like demand for denuclearization” – offering nothing concrete in return. One or more summits between Kim and Trump won’t likely achieve what the first ever formal meeting between a US and North Korean leader failed to accomplish. DLT may genuinely want improved US relations with North Korea. Pompeo and Bolton in charge of the regime’s geopolitical agenda undermine the possibility. 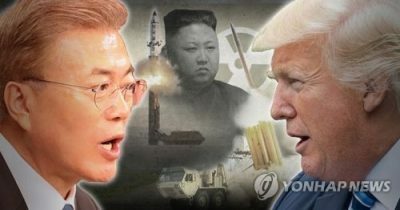 They want unbending pressure, full denuclearization, elimination of DPRK ballistic missiles, and full compliance with other US demands before implementing anything Kim and Trump agreed on. Unacceptable US hostility toward North Korea has persisted since WW II ended. Nothing going forward suggests a policy change. Washington needs enemies to pursue its imperial agenda. None exist so they’re invented, including North Korea throughout the post-WW II period – despite the country threatening no one. Nothing suggests a change in longstanding US policy ahead. Reasonable DPRK demands are rejected in return for its genuine willingness to denuclearize – including iron-clad security guarantees, a formal end to the 1950s war, lifting of all unacceptable sanctions, and normalizing relations with the West. Kim sensibly wants a “phased and synchronous” approach, “action-for-action” by both sides, incremental lifting of sanctions and other positive steps by Washington, matching North Korea’s good will. Trump regime hardliners Pompeo and Bolton refuse to comply, pushing for total DPRK denuclearization and elimination of its ballistic missiles, wanting its military rendered defenseless against hostile attacks if launched. Kim and South Korean President Moon Jae-in appear to genuinely want improved relations. Will Seoul go its own way with Pyongyang, independent of US actions? Last month Foreign Minister Kang Kyung-wha suggested the South was willing to lift restrictions on the North as a good will gesture. “(t)hey won’t do it without our approval. They do nothing without our approval,” treating the country’s leadership like vassals. “Maximum (US) pressure” until full DPRK denuclearization in return for likely betrayal like many times earlier remains hardline US policy. Will last June’s summit agreement unravel because of one-way US demands? It’s likely given how often Washington breached numerous other treaties, conventions and agreements earlier. Betrayal is longstanding US policy.